Get ready for High School Prom, Mother's Day, Graduation, Wedding, Vacation, or any occasion. How long does this patented process take and what are the results? How often should I use the maintenance product, KeepWhitePen? Who may benefit from the BleachBright system? I have a crown on my anterior or front teeth. Will your product whiten my crown? Is this procedure done by a dentist? How long before I can eat or drink after my treatment? Using our patented one size fits all double sided mouthpiece/lens, you will receive foam strips that are impregnated with a special whitening gel and other essential ingredients. A patented spectrum blue LED (ADT-1500SP), with precise settings, is positioned between the upper and lower teeth. This formulation forces activation. Hydrogen peroxide and oxygen will break into water molecules and free oxygen radicals. The oxygen radicals combined with carbon-based molecules in the stained teeth proceed to make all stains clear. This process will penetrate the tooth enamel but will not damage the enamel. Once the stains are removed, they will then attach themselves to the form strips. This is referred to as a physical stain removal at the speed of light. Two to four years is not unusual, but we do recommend that you now care for your newly bleached teeth with our new era formulated KeepWhite Pen. Typically, we recommend pursuing another treatment in about six months. Results can vary as everyone is different. The grade of your teeth and your age can affect the process, but we recommend a 15 minute treatment. We would recommend it as a daily maintenance and to use it especially for special events, dates, and/or engagements; anytime you are meeting with the public. Research has shown that if the teeth and gums are normal and healthy there are no adverse effects to bleaching one's teeth. You must make sure the dosage is of legal limits and not excessive and administered in a professional manor. People with tooth decay and with any type of gum disease should avoid this treatment. Never treat a pregnant woman; no know side effects are affirmed but it is simply a precaution. 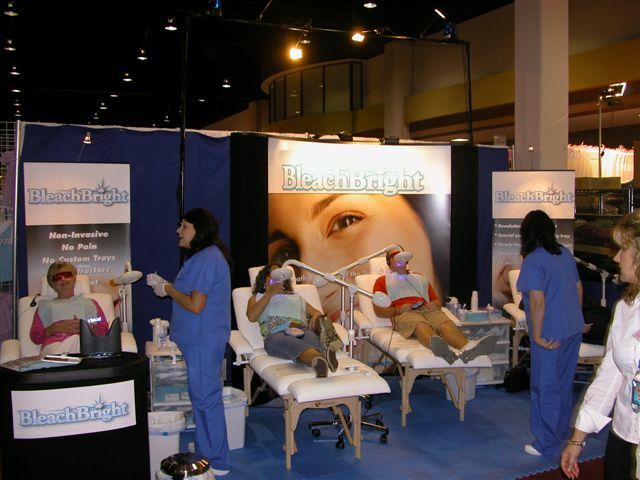 Almost everyone can enjoy the benefit to the bleaching process if their teeth and gums are healthy. Remember, teeth can not be bleached whiter then genetically possible. Tetracycline stains can not be removed. Also any stains resulting from excessive fluorides or if the teeth are porous, one can expect little result. Excluding the above, about 95% of our clients experience success. No, but the standard procedure is to first whiten all adjacent teeth, wait two weeks for the color to stabilize, then go to your dentist and have him match the crown to the new shade of your teeth. On the contrary, if a crown is already been in place for many years, the whitening process can return the rest of the teeth to the original shade prior to the crown placement. The same goes for composites, bridges, and veneers. Absolutely. 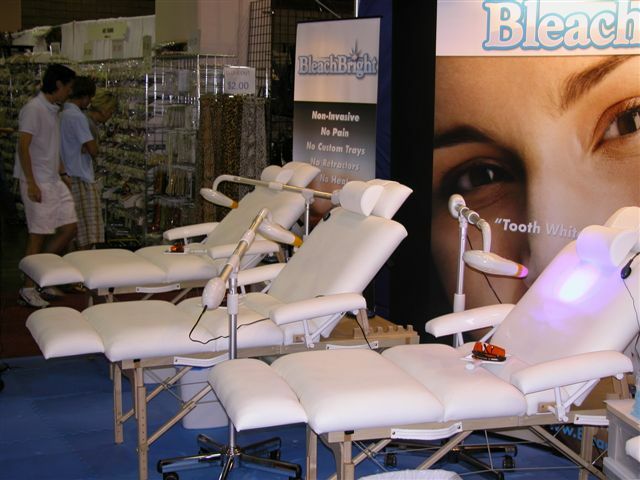 Our partner in dentistry actually supplies a great deal of product to dentist offices throughout the nation. Our carbamide peroxide, although at legal limits, are in many cases more potent than what your dentist will supply. 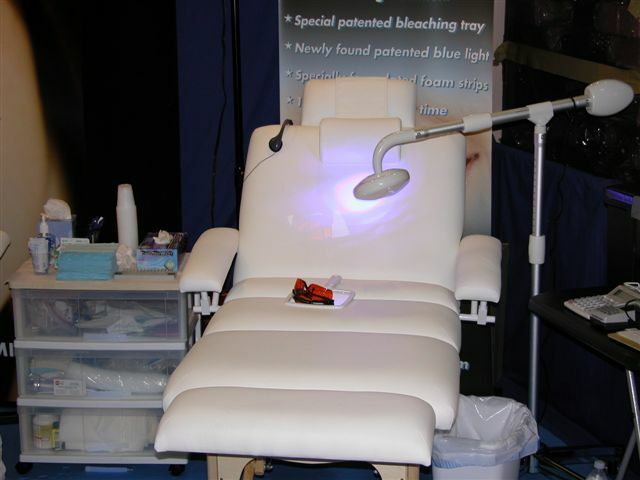 The key to the success of our whitening system is our patent blue light technology which increases the potency of whitening in fraction of the time and cost. 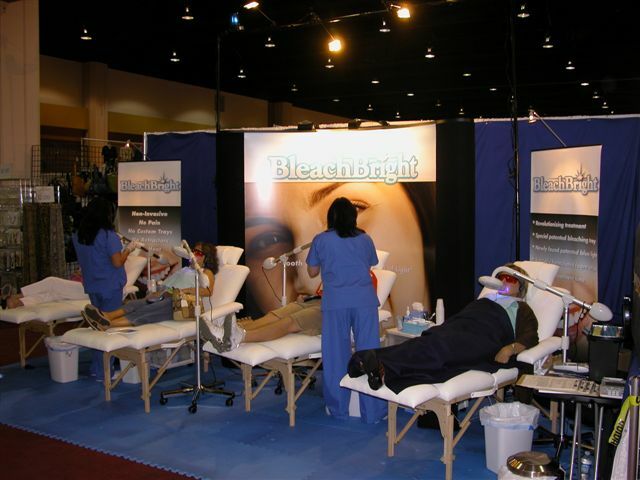 This bleaching process is provided by professionals in the teeth whitening business and are not necessarily a dentist. Some teeth are naturally pigmented or stained as they develop. Typically, stains come from exposure to tea, coffee, smoking, juices, colas, wine, age, or just about anything that would stain a white tee shirt. This is why we highly recommend the KeepWhite Pen to stay bright. Some people may feel a little tingling sensation, white gum line, or sensitivity, all of which are normal and hold no real danger. Typically, this will only last from a couple of hours not to exceed 24 hours. The first 24 hours we would recommend to avoid coffee, tea, dark colored sodas, red wines, berries, candy, red sauces, beets, or any foods that have the propensity to stain. Remember if it leaves a tee shirt stained it will stain your teeth.